A seven goal performance by Argentinean Matias Magrini lead the way for the Hublot team as it scored an exciting 11-9 over the previously undefeated AMG side in the finals of the 2010 AMG Miami Beach Polo World Cup. Hublot jumped out with a quick 5-0 lead in the opening chukker getting 3 goals Guille Usandizaga and a long 2 point goal from Magrini before AMG got on the scoreboard. Pelon Escapite scored the first goal for AMG followed by a penalty conversion from team captain Michael Liss to win the chukker with Hublot ahead 5-2. Three consecutive goals from Magrini opened the second chukker of play as AMG struggled to break through the Hublot defense. Nacho Figueras who had been so effective for the AMG offense in the opening rounds of play scored 3 goals for AMG, with Usandizaga heading a single goal for Hublot to end the chukker. Hublot rode off the field with a commanding 9-5 half time lead. Both defenses tightened in the third chukker with Escapite scoring for AMG followed by another goal from Magrini. Hublot continued to control the game holding on to a 10-6 advantage going into the final chukker of play. Magrini notched his seventh point of the game on a penalty conversion in the fourth chukker just before AMG mounted a final rally. 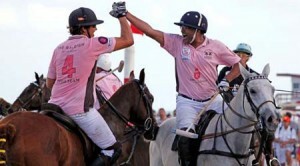 Three straight goals from Escapite brought AMG to within striking distance but Hublot controlled the ball for the final 30 seconds of the game preserving the 11-9 win in the 2010 AMG Miami Beach Polo World Cup. Magrini lead all scores with 7 goals and was named Most Valuable Player for his efforts. His 10 year old chestnut mere, Crucera, was honored as Best Playing Pony in the event. John Gobin scored the first two goals of the match as Bombay Sapphire defeated the Setai 11-6 in the Carl Fischer International Challenge Cup at the beach area of the Miami Beach Polo Club. A combination of Gobin and Luis Escobar accounted for 10 of the 11 goals with Angela York, playing the first 2 chukkers for team captain Lance Vetter, scoring a single goal in the second chukker. Bombay Sapphire held a 6-3 half time lead as the Setai fought to stay in the game. Bombay went up 8-4 at the end of three and got 3 straight goals from Gobin to lock the game up in the fourth and final chukker of play. In a low scoring event, Morgan Stanley got 4 goals from Brandon Phillips to defeat Ferretti 5-3 in the Fleischman Memorial Cup at the Miami Beach arena. Ferretti struggled throughout the match to mount a consistent offense as it was shut out in both the second and fourth chukkers. Simon Garber and Phillips closed out the scoring with single goals in the Morgan Stanley win.